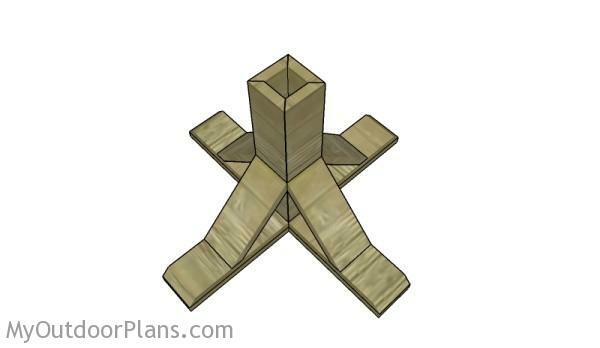 This step by step diy woodworking project is about Christmas tree stand plans. 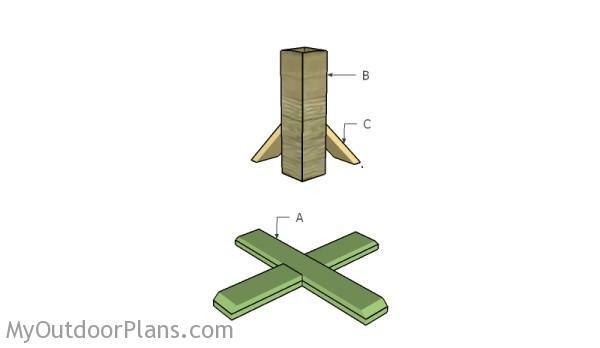 The project features instructions for building a wood Christmas tree stand using common materials and tools. Make sure you make any necessary modifications to the plans, before cutting the wood. You don’t need to buy an expensive stand with a common look, when you can build one using common materials in just a few hours. The first step of the project is to build the slats for the tree stand support. 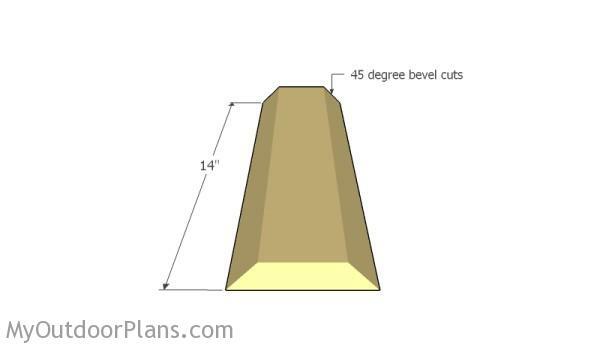 Cut the 1×4 slats at the right dimension and make 45 bevel cuts to the sides, as shown in the diagram. Smooth the edges with attention and remove the residues with a damp cloth. Join the slats together, as shown in the plans. 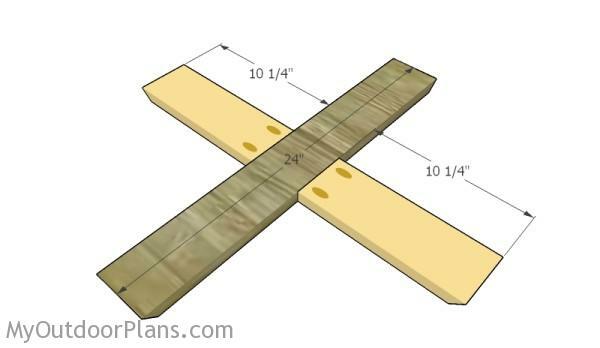 Align the edges with attention and secure everything together with 1 1/4″ brad nails and glue. Use clamps to make sure the slats don’t move from position. Next, you should build the base for the tree stand. Cut the slats at the right dimensions and drill pocket holes, as shown in the diagram. Center the small slats to the main component and secure them into place using 1 1/4″ screws. Add glue to the joints and remove the excess with a damp cloth. As you can see in the diagram, you need to make bevel cuts to one end of the components, in order to get a professional result. Smooth the edges with sandpaper. 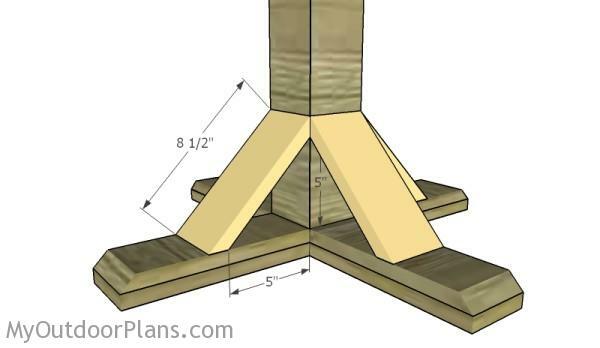 Attach the base to the main support, making sure all edges are aligned. 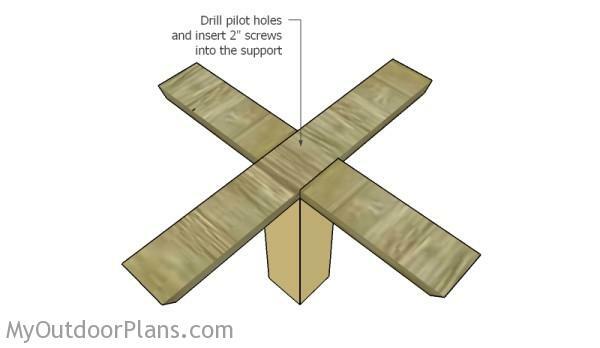 Drill pilot holes through the base and insert 2″ screws into the four slats of the main support. Add glue to enhance the bond of the joint. 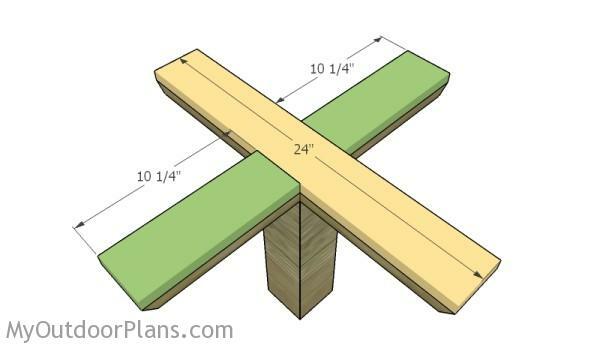 Continue the project by attaching the rest of the 1×4 slats to the base. 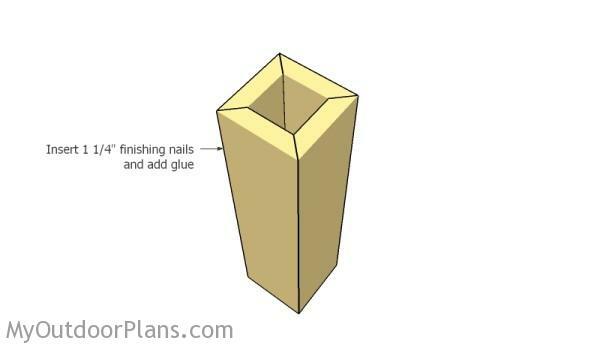 Add glue to the joints and then insert 1 1/4″ finishing nails to lock everything together. Las but not least, you need to attach four braces to the enhance the rigidity of the tree stand. 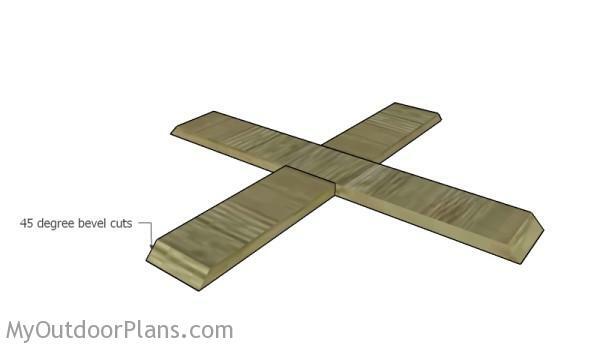 Cut both ends of the 1×4 slats at 45 degrees. Use glue and 1 1/4″ finishing nails or screws to lock everything tightly. 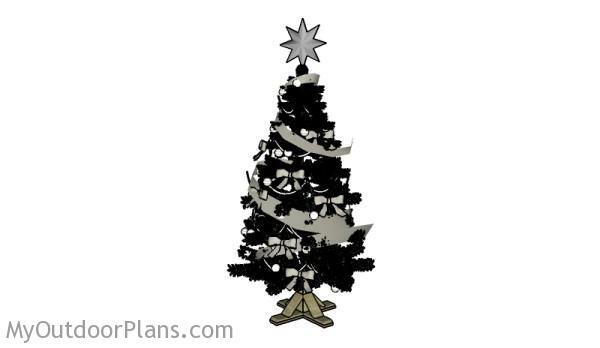 Remember that you can adjust the size of the Christmas tree stand to suit your needs. If the tree fits loosely, you should drill pilot holes through the support and insert 2 1/2″ screws, from all four directions. This should keep the fir tree into place tightly. Fill the holes and dents with wood putty and let it dry out for several hours. Use 120-200 grit sandpaper to smooth the surface. Remember that you can adjust the design and the size of the Christmas tree stand to suit your needs. Top Tip: If you want to enhance the look of the project and to protect the components from decay, we recommend you to apply paint or stain.